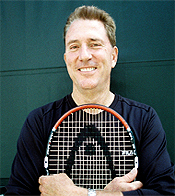 When I began teaching tennis in Golden Gate Park in the early 1980's I had two experiences that helped shape the course of my career in tennis. I was playing USTA Norcal 4.5 tournaments myself , but I also got in the habit of watching the matches of some of my friends from the Park, who were dominating the Northern California Open division. If you know the history of Norcal tennis the names will mean something to you: Peter Pearson, Mike Howard, Eddie Barreto. Then an amazing thing started to happen. After watching this beautiful, high level tennis first hand, I would play much better myself. Sometimes a level better. I played out of my mind and won the Park 4.5 final over one of the other staff teaching pros. This was how I first discovered the power of direct visual learning. I found that it was possible to absorb something directly from other players, a kind of tennis osmosis. During this same time I was also experimenting with another unconventional training technique: teaching and playing to music. During my lessons I played rock music from a boom box on Court 18. A few of the regular players at the Park didn't appreciate it, but again, I saw amazing things. Two avid beginning women, wonderful students but not world class athletes (to say the least) suddenly began having 10 and 20 ball rallies. In my playing lessons, my students and I would often get into a rhythm and play unbelievable points. Then I began picking special songs and singing them to myself during my tournament matches. I passed this with one great success to my championship girls' high school team. Those two factors: music and visual imagery, were combined in my first major instructional project, The Winning Edge video with John McEnroe and Ivan Lendl. The tape continues to sell today, and two of the segments are included here. Over the years I have made numerous additional tennis music video segments as well. Now you'll be able to see those on Tennisplayer. Hopefully they'll inspire you and raise your level of the play the same way they have worked for me over the years.